A Spectrem Group monthly investment trends survey finds for the third consecutive month an increase in Affluent investors who indicated that in the coming month they would hold on the investment sidelines rather than invest. This attitude was strongest among Millionaires, who are generally more optimistic and more confident investors. Among Affluent investors overall, “Not Invest” ticked upward 1.6 points to 41.60, a six-month high. But this investment option is down 3.40 points from August 2013. 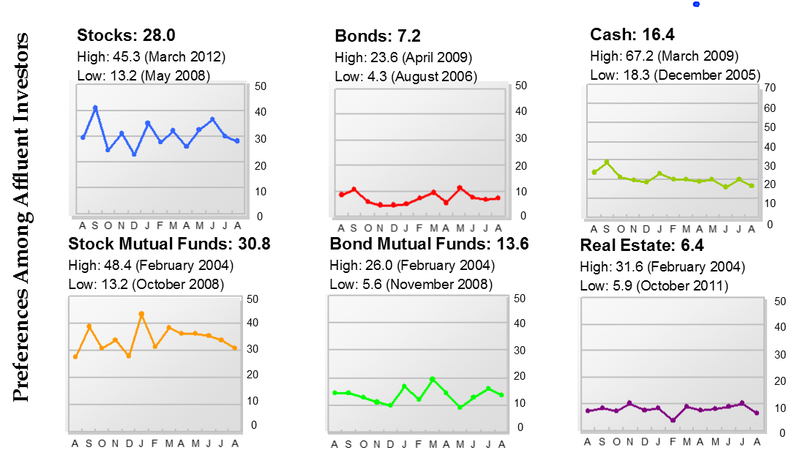 Bond Mutual Funds is the next highest investment preference at 13.60, a loss of 2.4 points. Bonds ticked upward 0.4 of a percentage point to 7.20, while Real Estate fell to a six-month low at 6.40, a loss of 3.60 points. Spectrem Group breaks down Affluent investment preferences by Millionaire and non-Millionaire households. Non-Millionaires generally exhibit more caution investing, but between July and August, the number who said they plan to hold on the investment sidelines remained basically unchanged, ticking downward 0.2 of a percentage point to 51.4. Among Millionaires, though, “Not Invest” gained 5.1 points to 34, which is a mere 0.1 of a percentage point down from the same period last year. When asked how they intend to invest in the coming month, more Millionaires indicated they would invest in Stock Mutual Funds (39.7, a drop of 4.8 points). Stocks was second at 30.5 points, a drop of 3.0, followed by Bond Mutual Funds (19.2, a decrease of 2.7 points from July). Cash posted the largest drop at 8.7 points to 16.3, while Bonds edged downward 1.7 points to 8.5, a four-month low. Real Estate took a seven-point hit to 7.8, a six-month low. Investment preferences are less volatile among non-Millionaires who intend to invest in the coming month. These investors indicated that Stocks would be their investment of choice (24.8 months, a dip of 0.6 of a percentage point from July). Stock Mutual Funds dropped 2.9 points to 19.3, a 12-month low. Intended Cash investment among non-Millionaires ticked upward 0.9 of a percentage point to 16.5, while Bond Mutual Funds fell 3.4 points to 6.4, a 28-month low. Bonds gained 2.2 points to 5.5, a three-month high, while Real Estate dipped 0.3 of a percentage point to 4.6, a five-month low. “Not Invest” among non-Millionaires is down five points from August 2013.